Setting up an automated RRSP contribution plan can substantially improve your life. Benefits include less stress (a lack of financial stress improves health, read about it here), removing emotions from investing decisions, avoiding missed deadlines, and you’re giving your money more time to work (compound interest means more for your bottom line!). The holidays are around the corner, and if you’re lucky enough to get a bonus it may be a good idea to start or top up your RRSP with that cash. Just make sure you understand the process so you can avoid any tax surprises! The Canadian government has capped the amount of money you can contribute to your RRSP (either 18% of your yearly earned income, or $22,000 – whichever is less) because of the tax benefits provided by RRSPs. The contribution limit is also referred to as the deduction limit*. Diversification is a risk management method that mixes a wide variety of investments within a portfolio. If a portfolio is properly diversified and constructed with different kinds of investments it’s more likely to generate higher returns and minimize risk for you, the investor*. An exchange-traded fund (ETF) is an investment fund that tracks an index (like the S&P500) and is traded on stock exchanges*. ETFs typically have lower fees than mutual funds and can hold assets like stocks, commodities, or bonds, and we use them to construct your customized portfolio! Having someone else manage your investments can help free up some of your time, so you can actually spend more time on the things that matter most and less time navigating your investments. Digital Wealth Managers like Nest Wealth can give you more time today and the money for tomorrow. Sign up here! Having enough money for a comfortable and secure retirement is a great financial goal that everyone should have. Maxing out the contribution limit in your RRSP each year (if you haven’t opened one yet, you can do it here) will help you get there faster. Other financial goals can include things like saving for your child’s (or grandchild’s) education, or saving up for that dream vacation! Holdings are what your portfolio is made up of (like ETFs, options, bonds…etc). The kind of holdings, and how many you have in your portfolio, can contribute to how diversified your portfolio is*. Investopedia defines income as money that a person (or company) receives in exchange for providing goods and/or services, and it’s often separated into day-to-day expenses, savings, investments, and taxes. Having an income is necessary to building wealth and living! 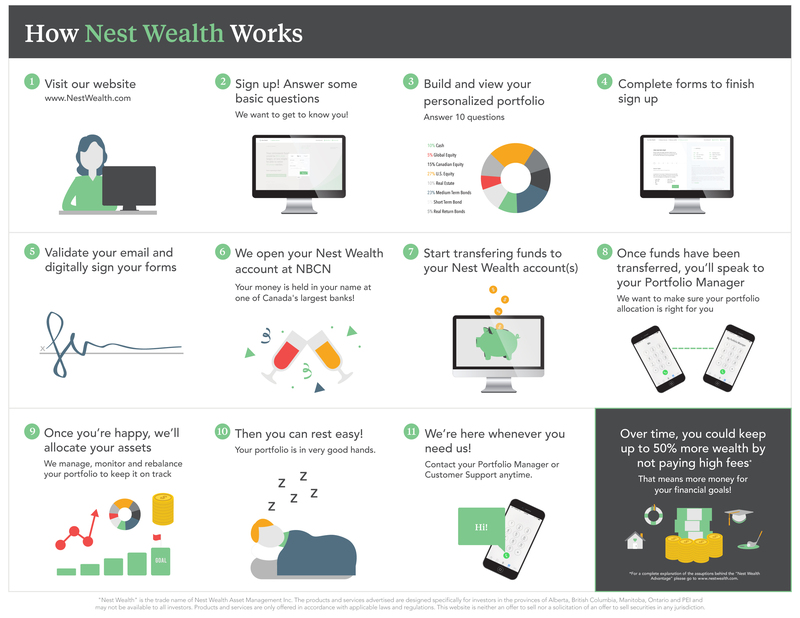 Unless you can justify paying high fees on your investments that eat up your returns (potentially totaling $323,654.40 over the course of your life), it’s time to switch to a subscription based investing service like Nest Wealth. Low fees and high returns mean more wealth for your retirement! The Know Your Client (KYC) is a standard form in the investment industry that ensures advisors know detailed information about their clients’ risk tolerance, investment knowledge, and financial situation*. In other words, it’s how we get to know you at first! Paying lower fees on your investments means more money for your bottom line in retirement. Nest Wealth charges as little as $20 a month, and no more than $80 a month – no matter how much money is in your account, or how much your account grows. We also don’t start charging until your account is funded, and there’s no minimum required to open an account. For more information on pricing and fees, click here. Money makes the word go ‘round, and in a way, it’s the product of all products. Contributing money to your RRSP can ensure you have enough money for a comfortable and secure retirement. Click here to open a Nest Wealth RRSP today! We are Canada’s first robo-advisor, and we make investing easy! Using smart technology and proven investment principles, we’re able to monitor and manage your custom portfolio at a fraction of the cost. We take a passive approach to investing and build your portfolio to “be the market”, not “beat the market”, because history has proven time and time again that you’re likely to accumulate more wealth by investing passively. So while you’re busy with life, your Nest Wealth Portfolio Manager is busy monitoring and rebalancing your portfolio, and ensuring your assets are properly diversified, in order to help you achieve your financial goals. If you’re looking for more financial piece of mind in retirement, and more time, freedom, and choice today, all you have to do is open a Nest Wealth RRSP. We’ll take care of the rest! Wealth can help you manage and achieve your financial goals. We also have a fiduciary duty – so you know your best interest always comes before ours! Passive management is an investing strategy, and is the opposite of active management. Passive managers track the market and know successful investing is about time in the market, whereas active managers aim to time the market in order to beat it. Research has shown passive investing outperforms those that are trying to beat the stock market. Using this as our foundation, we build your portfolio to “be the market”, not try to “beat the market” (meaning Nest Wealth clients have better constructed portfolios at a lower cost than a traditional fund, and are also likely to outperform most mutual funds over the long run as well! Read more here). We know that you may have questions about your investments and we are always available to answer them for you. Be it over messenger, email, Skype, a phone call, or in person, we’re here when you need us. According to a study by Statistics Canada, 31% of those surveyed between ages 45 and 60 said their financial preparations for retirement were insufficient. Further, a study by RBC revealed 56% of non-retired Canadians were worried they wouldn’t be able to enjoy the life in which they are currently accustomed to. Retirement is many things, but boring shouldn’t be one! Having an RRSP you can contribute to, then withdraw from in retirement will most likely be essential to your quality of life when you reach retirement. Investing is one of the most powerful tools to grow your wealth. Put your money to work for you, and you eventually won’t have to work so hard for it. Start here today! Saving will help you manage your budget, afford gifts and vacations, deal with unexpected expenses, use less credit, and ultimately ease financial stress. However, most people can’t rely on savings to fund their long-term goals, like retirement. Why? Because money in a savings account earns minimal interest, therefore produces minimal growth. Investments, on the other hand, can grow. The question isn’t if you should save or invest, it’s how much money should you put towards your savings and how much should you put towards your investments. Build your customized portfolio today to see what’s right for you – click here. RRSPs have many benefits, two of which are not to be ignored: the tax refund you receive when you make a contribution to your RRSP, and tax-deferred growth (for as long as your money remains in your account, on up to 18% of your previous year’s income). Money in your RRSP will eventually be taxed when you withdraw it, but because most people earn less income in retirement, the withdrawals should end up being taxed at a lower rate! Each client is unique, so we construct custom portfolios to fit each and every Nest Wealth client. No buckets, no grouping – just a portfolio that fits you. Click here to build your customized portfolio (its free)! Investment fees in Canada are way too high, and if you’re still paying any mutual fund company or advisory firm a large percentage of your assets to provide their services, it’s time you asked “why”. If the answers and value of service you get aren’t worth hundreds of thousands of your hard-earned dollars, then perhaps it’s time you checked out Nest Wealth. Click here to find out how much you’re paying in mutual fund fees each year, and see if you should make the switch. Your definition of wealth will depend on who you are, your interests, your stage in life, and ultimately what your values are. To us at Nest Wealth, wealth means having more time, freedom, and choice. More time for our clients to spend on the things that matter most to them, more freedom for our clients to spend their time as they wish, and more choice as to how our clients spend their time and freedom on what brings them the most happiness. Looking at it another way, to the young professional, wealth may mean being able to afford rent, food, and some after work drinks with coworkers. To the athlete, wealth may mean being able to afford equipment and training. To the cancer survivor, wealth may mean having a clean bill of health. And to the grandmother with five grandchildren and three great grandchildren, family may be the greatest form of wealth. See how the meaning of wealth changes depending on what our values are? As the saying goes, you can always make more money, but you can’t make more time. Sign up for a Nest Wealth RRSP – we’ll help free up your time today, while helping you build wealth for tomorrow. Click here! X: X Marks The Spot To Sign Your Digital Forms! Our onboarding process is online – that means your signature is handled digitally as well (don’t worry, it’s a very safe and secure process!). Take a look at our helpful infographic to better understand our sign up process: See it here! A yield is the income return on an investment (like interest or dividends)*. Okay, this one’s a little silly, but it’s the sound of you sleeping peacefully as a Nest Wealth client knowing your portfolio is in good hands. Ready to change your life? Click here. Regardless of your view of the market, contributing to an RRSP is a smart money move. Join thousands of Canadians on the journey to more wealth by signing up today. Click here to build your personalized portfolio and see the difference a Nest Wealth RRSP can make!